It is understood the association accepted the offer and that two board members, Michael Cody and Eddie Murray, have both voluntarily resigned. The Board also said it wishes to assure members, football supporters and all stakeholders and sponsors that it is "expediting all processes designed to restore faith" in it. The Board said the FAI will update Sport Ireland on all developments ahead of the meeting of the Oireachtas Committee on Sport tomorrow. When asked if Mr Delaney would continue to get paid while the investigation took place, the FAI said "no comment". It comes as Sport Ireland is expected to tell the Oireachtas Committee on Sport when it appears before it tomorrow that a full audit of the FAI may be necessary before it restores funding to it. It is set to say it will consider this depending on what emerges from the Mazars and Grant Thornton reviews. In its opening address, seen by RTÉ News, it is set to tell the committee that the FAI's account of its financial situation in 2017 gives rise to serious concerns about the FAI board's governance and oversight role. Sport Ireland is also expected to say that it is also concerned about the FAI's adherence to appropriate financial and management control procedures during this time. It comes as a former president of the FAI said that "each and every one of the board should consider their position". Des Casey was speaking ahead of a meeting of the board of the FAI this evening. Speaking to RTÉ News, Mr Casey said he believes the FAI has gone from a "reasonably democratic association to a autocratic one". He said the reputation of the Association has been "severely tarnished" by the latest crisis. Mr Casey said he feels shattered and sad for the people, the players, the schoolboys, the development officers and the referees, who have given so much commitment to football in Ireland. He said the rules need to be revised and the FAI needs to become "a more democratic association". He added that the domestic league has suffered more than anything in recent years and it needs to become independent of the FAI again. Mr Casey was president of the FAI from 1984 until 1986. He also served on the FAI Executive and as honourary treasurer. He served on UEFA's youth committee and made an historic breakthrough by becoming the first Irishman elected to UEFA'S executive committee. In 2000 he was elected vice-president of UEFA. 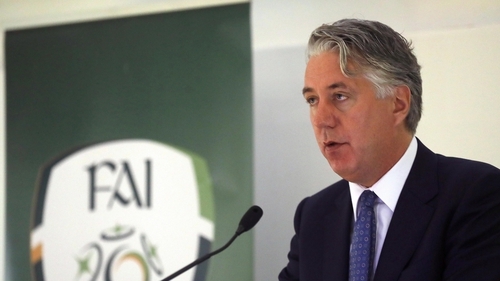 The FAI last night said it would give additional information sought from it by an Oireachtas committee by close of business today. In the greatest crisis football's governing body has faced in over 20 years the FAI promised root and branch review of its own rules and processes. It says it is working to restore the trust of its stakeholders including the Minister and Sport Ireland as soon as possible. And it promised to answer all questions asked by members of the Oireachtas committee by close of business today. Fianna Fáil's spokesperson for Tourism, Transport and Sport has said the current board of the FAI should go. Speaking on RTÉ's Today with Sean O'Rourke, Robert Troy said he does not have confidence that the existing board has the desire or ability to get to the bottom of recent controversies. Mr Troy said that everything Mr Delaney has done has been assisted by this board and the board has failed in its duty. Niamh Brennan, of UCD's Centre for Corporate Governance, said the board needs to be more plain speaking and that taxpayers are entitled to thing that their money is going into an organisation that is well run.